Comments: This proof variety was discovered by Walter Breen and first listed by Kam Ahwash. 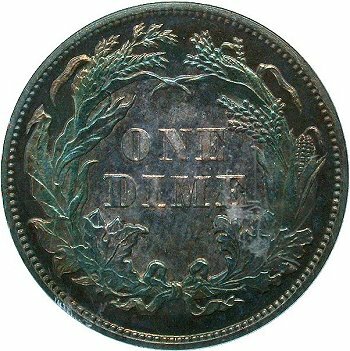 Its discovery initiated the study of Seated dimes for blundered or "misplaced dates". The 1 digit is punched twice into the base directly above the final 18 digits in the date. The full base and upright of the higher misplaced 1 is clearly visible below the end of the scroll. 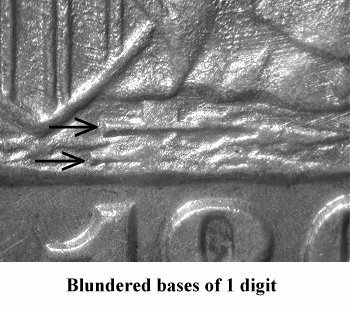 The left base of the second 1 digit is visible below the upper blundered digit. 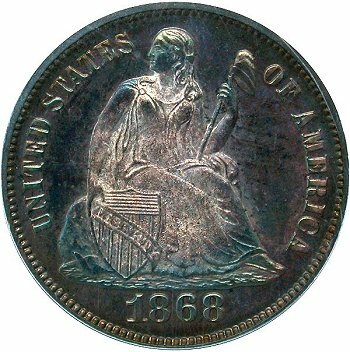 Obverse 5 also exhibits radial lathe lines in Liberty's upper body. 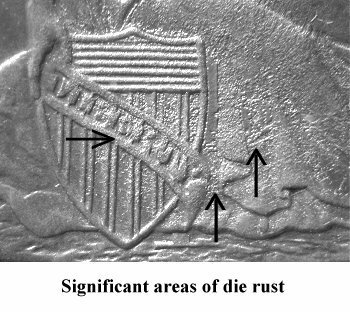 The upper shield and gown area to the right of the shield appears rough, as if from a rusted die. 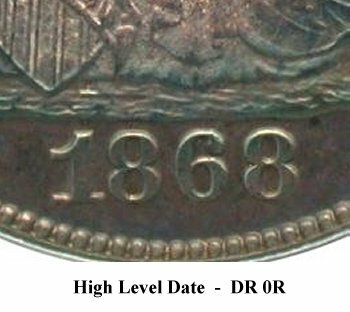 Reverse E shows some minor die doubling on the ribbon ends and throughout the wreath. The variety is also listed by Breen as BR-3345 and in the Top 100 Varieties as proof only. However, at least one business strike example has been certified from this die pair. See Variety 105a.